We are so very deeply grateful for your zeal for souls, prayers and generous donation. The persecution of Christians today is militant and spread throughout the world. Our daily struggle increases as financial and health concerns plague our homes. Many of our children have lost the faith. With your help, we are reaching out to as many as possible with the Pure Heart of Mary, that She may bring us all safely to port in Heaven. May God protect you and give you peace of soul in these troubled times! Blessing the hour is a wonderful practice: I use this small prayer: “All for Thee, O my Sweet Jesus, through the Immaculate Heart of Mary.” This practice gives me peace and strength, and keeps me united with Jesus and Mary all day long. Satan understands this perfectly and wages an endless battle to distract, discourage and derail us from our good intentions to be constant in prayer. The spirit of prayer is the union of our wills to the Will of God. Our purpose must be the Glory of God, rather than the acquisition of favors whether spiritual or physical. How carefully we must preserve high moral ideals which safeguard the purity of our lives. Each one of us bears a heavy responsibility to do battle in the trenches and face the onslaught of the enemy. God’s Glory depends upon the salvation of souls. We must begin with ourselves. Sanctification must be our goal. True love rises above creation and is steeped in God: In Him, for Him and through Him. Such love of neighbor embraces ALL: the good and the bad, friends and enemies. Today, the evil spirit does not wait, but deliberately works quickly. We must do the same. We cannot stop our efforts for any reason whatsoever. We must continue to give without limit, even to the outpouring of our blood, if necessary. Our goal is the sanctification of all souls through the Immaculate Heart of Mary, even unto the end of the world. One by one, Decade by Decade, we can conquer the world for Christ! If you are able to distribute any of our leaflets, prayers cards, a Calendar or newsletter to others, we are happy to send them to you, free of charge. May God reward your zeal and the sacrifices you make for souls! I remain, one with you, in the Immaculate Heart of Mary. Thank God, I reached Sibi on April 9th at 1 p.m. When I ordered my train ticket, I requested to be given the lower or middle berth as it is difficult for me to go to upper berth. But when I got in the train on the 8th at 7 p.m., I found my reservation was for upper berth. Then, there was a Muslim family who said to me, “Go to your berth and stay.” It was very difficult for me but I had to, and during night I came down twice and then went up. It was the worst train journey of about 18 hours. Fr. Amir had sent Bro. Shahzad to pick me up from the station. At night, there was a new problem of countless mosquitoes. They attacked like an army of troops. Due to this, the first night, I could not sleep till 5 a.m. The next day, Father gave me the mosquito killer spray but it did not work properly and still there were mosquitoes. Can you remember, you had once asked me to contact the bank about purchasing a car on instalments and I had applied for it to the Bank Al-Habib. An officer called me and they are willing to give me a car. I had this conversation on April 8, the day I was to travel and there was no time to ask you for permission, so I told him about my travel and asked him to contact me on 17th upon my return from Quetta. Now, please give me your advice: should I contact him or not? They will need a down payment (he will give detail about the amount) and then a monthly instalment for three or four years according to our agreement. Travel without a proper vehicle is very difficult due to constant back ache. There is an annular tear at L3L4 and canal stenosis. The spinal doctor recommends rest and surgery. I cannot rest so long as there are souls to reach with Our Lady’s Living Rosary. Please pray for me. God bless you! THE LIVING ROSARY, PAKISTAN – MARCH 2016On 6th March, I left for Peshawar to reach there early in the morning. Mr. Tariq, the principal, picked me up from the bus stop. I visited St. Thomas School and St. John’s School. I explained about the Living Rosary and the purpose of the Daily Decade. The students and teachers were enrolled. They were very happy to receive the devotional items and be a part of the Living Rosary Family. After lunch, Catechist Gul Sher took me to Bishop Hatinga Colony. We visited the surrounding Christian homes to spread the Living Rosary message and then enrolled new members. Fr. Farhan had invited me to visit different areas of Multan. On 13th, I attended the morning Mass at Most Holy Redeemer Cathedral. Fr. Yousaf Sohan gave me time to explain the purpose of the Living Rosary and, with the help of Sr. Firdous and Sr. Sofia, I enrolled new members and gave them the Decade Cards, Rosaries, Medals, booklets and other devotional items. On the 14th, I visited the Dominican Middle School and Saeed colony where the people gathered in the church to hear about the Living Rosary mission. I was invited by Fr. Naveed, OP, Dominican Formation House, to have a meeting with the Seminarians, On 15th, Fr. Farhan took me to Good Shepherd School, Gulraiz Town where I was invited by Sr. Nasira, the principal. Father started the session with a prayer and Sr. Nasira welcomed both of us. At all the places, new members were enrolled and Decade cards, Sacramentals, booklets, holy pictures and printed materials in English and Urdu were distributed. Fr. Farhan was very thankful to the Living Rosary for my visits and he gave a ‘Thank You’ letter also. I also visited many places in Karachi but, due to some health concerns and laptop technical problems, I could not send you the pictures. I will send you the photos at the earliest. In the evening, I left for Faisalabad. Thank you for your prayers and support! We are told to cast all our cares upon God, for He cares about us. What great consolation these words should bring to our innermost souls! We need to keep them in our hearts and recall them to mind the moment they are needed. They will increase our faith, arouse our spiritual vigor and secure for us that victory which we must gain in order to possess even a small part of the peace of God in our souls. We must cast not only a part of our cares upon God, but ALL cares without exception! We can never know with positive certainty that the salvation of our souls will be secured. The very thought of this can make us tremble. Examining our conscience and seeing the sins of our past, we might be tempted to despair. God’s Mercy is exalted above His Justice. After making a sincere Act of Contrition and a devout Confession, we must then cast our salvation upon that Mercy which is never withheld when asked for with humility and sincerity. This should be followed with sacramental Communion. You may say, “I am sure to repeat these sins again.” This is a lie of the evil one and a deceit of our own weakness. Fidelity today, wins Grace for tomorrow! Those who speak in this negative way, yield to temptations before they come. This is a form of despair. We are commanded most sternly and positively NEVER to despair of our salvation at any time, in any place, nor under any circumstances. Care of our bodies, our human life in this world, with all that belongs to it, gives us great concern. Christians and Pagans think and act as if life in this world is our all and that success, honor, wealth and social position once secured here, without any thought of eternity, allows man to die in peace. When earthly goods, health, and independence are lost, many turn against God and lose their faith, simply because they did not and do not cast their cares upon the Lord. God knows what is best for us. If we are careless about our duties to God, do not obey the laws of our holy religion, follow the ways of the world and feel ashamed to acknowledge courageously that we are Catholics, then we know the world has nearly overcome us. It is time then to be strict in our duty to pray! If we are to save our souls, we must pray! We need not make long prayers, nor do we have to offer them in church. But, we must launch out into the deep. That is, we must separate ourselves from attachments and affections of the earth. It will be most profitable if we can single out one virtue of which we stand in need, and make that special virtue the subject of our prayers, thoughts and efforts for weeks, months or years, if necessary, until we gain it. Perseverance is, after all, the test of genuine prayer! Do not mind how long you have prayed and do not weary though your progress be small, God will always reward your perseverance in prayer. Multitudes today are without God, without Christ. They will not follow Him out to the desert, will not listen to His words, or ponder upon them and will not ask for the Grace to believe and be filled with Truth. In pride, in deluded self-satisfaction, in the bustle of life, in the entanglements of passion or business, they suffer life to run on in a half-hearted way, desiring Truth but never coming to the knowledge of it. Be vigilant amid the numerous dangers and temptations by which you are surrounded! Let the light of Faith be not darkened. As Christians, we must manifest the Faith in all its luster and might. May our Faith shine in the world as Christ shone to men! It is not we who work but Christ Who works in us. Our Holy Catholic Faith is the source of our greatest happiness even while we are upon earth. During these days between Easter and Pentecost, we pray to the Holy Spirit with longing and expectation, asking Him to help us strive to be like Christ Who went about doing good to all He encountered. Know that you are never alone. When God seems the farthest from you, that is when He is the closest. Your sufferings and prayers are needed that our mission in the bosom of Holy Mother the Church may be strengthened and completed. We remember you, your family (living and departed), and all of your needs, spiritual, physical and material, each day at the Holy Altar. + In the Name of the Father, Son and Holy Ghost. Amen. Dear Patti,I hope that you and everyone there at the ULRA are doing fine. It has been a few months since I have written, so I wanted to get this mail to you. I was released from prison on 16th February after serving three years. You can imagine my surprise when I was told, I had to report to Laurens County Jail on charges from 2013 that I thought had been taken care of in November 2014. I am sitting here in jail now for one full month and have not been told anything except they will get me into court whenever they can. It seems to me that the letters I have sent out are being destroyed. I have written to 5 contacts that regularly and in a timely way always answered my mail, and have had no reply from any of them. The request forms I write to the officers about my mail are unanswered. I have not seen or talked to a lawyer or court official since being returned to jail. I am asking you and everyone at the Living Rosary to keep me in your prayers. May the Lord continue to have His Will done in all the aspects of my life. I continue to pray my Decade and I pray also the whole Rosary each day. I have no Rosary, no chaplain, no prayer book, nothing! There are no religious services available here. If you reach me, please send me spiritual reading materials and the Dedicated Decades. God continues to bless me daily and I am thankful for all that I experience each day, even sitting here in this jail because I know that I am never alone. Our Lord Jesus Christ is with me every step of the way and Our Holy Mother Mary protects and directs me, as I seek her Son, Our King, in every situation. I also realize there are those in the world who are in a much worse situation than the one I am in here. Whether free in society or locked up, I will remain loyal and faithful to Our Lord and Our Holy Mother, Mary. (6) Holy Spirit Church, Thiruvalankadu – Fr. John Louis. After the ceremonial blessing of the Brown Scapulars, about 300 members were invested with Our Lady’s Garment of Grace. A total of 280 new members were enrolled in the Living Rosary. Ave Maria! Dear Apostles of the Immaculate Heart of Mary,Thank you so very much for your generous donation which is a grand help for us in reaching out to missionaries with the beautiful Sacramentals and devotional leaflets we have on Our Blessed Mother. We are deeply grateful. May you have a Blessed Easter filled with abundant blessings, deep joy and peace of soul! The Rosary is the wonderful blending of Mother and Son, the Gospel transformed into prayer, the Life of Jesus through the eyes of Mary, His Mother. When we pray the Rosary, we have the words of Heaven on our lips, the love of Mary in our hearts, and the Life of Christ in our thoughts. Christ is the Heart of the Rosary, the very heart of His most Blessed Mother! Cherish the Holy Rosary, wield it in battle, pray it often, love it deeply! Peace be to you! Christ has Risen! Alleluia! Our prayers are¬ with you both day and night. Do you desire to know Christ more fully, long to love Him more than you do now and wish to find salvation in Him and through Him? God has put you on earth that you may save your soul. Your soul is your greatest treasure! It is your better self. It cannot die because it is a spirit. It is made in the image and likeness of God. It will live as long as God lives. Men of good will rejoice that they are destined to live forever, because they realize their eternity is to be spent with God in a state of unending happiness. But, what will eternity hold for us? Will it be Heaven or Hell? We must enter by the narrow gate, for wide and broad is the way that leads to destruction, and many there are who enter that way. What do you think of your soul? Do you know its value? Christ has esteemed and loved your soul so much that He was crucified and died for its salvation. It is more precious than all the possessions and glory of this world. Whatever else you may possess, when you come to die, you must leave it all behind; your soul alone you take with you to appear before the Judge Who will reward or punish you, either with eternal glory in Heaven or eternal shame in Hell, according to your conduct on earth. Here on earth, we are on probation. It is a testing ground for eternity. Faith alone does not save you. The Father has loved you and gave His only Son to redeem you; the Son has loved you because He died on the Cross for your salvation; and the Holy Ghost loves you because He is at work in your soul to sanctify you. See then, how precious your soul is in God’s Eyes. Mary became the spiritual Mother of all the redeemed at the Incarnation. She is also your Mother. Acknowledge her as your Mother, and you will find Christ. Mary is your way to Christ. St. John received Mary as his Mother not only for himself but also for all of us. The Mother of Christ is the Mother of all Christians. After you have found Mary, and through Mary, Christ, your Savior, you are on the secure path toward Salvation. It was by Mary that our salvation began. We must go to Mary and pray to her if we are to be given the grace necessary to find the True Church of her Divine Son and be saved. Christ conferred upon the Apostles the power to teach, govern and sanctify. “Simon Peter, feed My lambs!” These words were addressed to Peter alone and they conferred upon him the primacy of jurisdiction over the entire Church. The Catholic Church and It alone possesses the Mark of Holiness; Christ, Its Founder, is Holiness itself. Christ instituted the Seven Sacraments which were to serve mankind as the seven Channels of Grace and Sanctification. Catholic means universal. The Catholic Church is Apostolic. It teaches the same doctrine which the apostles taught, It inherited the same mission or authority of uninterrupted succession of pastors and the apostolicity of the Church is theirs alone. Let us remain steadfast and cling always and fearlessly to our Catholic roots of DOGMA, DOCTRINE and DEVOTION! Dear Patti,I apologize for being so late in responding to your request for a picture. No excuse, I am just getting older and don’t do things as quickly as I did a year or two ago. In 1965-1966, I flew in Vietnam, for a year. The aircraft I flew was the largest the Army had assigned since WW-II. Unfortunately, our legislators, in their infinite wisdom, decided the airplane should be assigned to the Air Force NOT the Army. I completed my lonely year in Vietnam and anxiously awaited my return to family life with my young family. I was home for less than a year before the Army decided they had an urgent need for my Infantry Airborne Aviator combat experience. They assigned me to return to Vietnam and fly an experimental airplane. The concept for the use of the airplane was to apply its innate silent capability with a dark colored paint to be near invisible at night. I was to fly this experimental airplane at very slow speed and very low attitude in search of enemy forces. It was very dangerous but, if it worked as hoped for, we could call for artillery fire and NOT be seen or heard by the enemy located. I said: “That’s impossible! How could you put more fuel in the tank than it would hold?” He responded to me: “Sir, the Lockheed Technical Representative said: You must have not only emptied the fuel tank but also the fuel line to the tank. The airplane was BONE DRY.” I was re-assigned the next day to Headquarters U.S. Army, Vietnam to be the Project Manager for the follow-on airplane. Our two airplanes were returned to Lockheed, Sunnyvale, CA, two days later. I felt bad for days. God saved my life after I killed all those people. I was awarded the Distinguished Flying Cross and the Bronze Star for my actions. That was the 9th time that I am aware of that God had saved me from sure death. The 10th time was in 2005 when I encountered encephalitis. I spent 13 days in a coma and was not expected to survive. A Lady’s voice called to me, “Please get up and do something PRODUCTIVE.” I concluded that Our Blessed Mother wanted me to do something for her. I am still doing that something = making Rosaries. In fact, a couple of weeks ago, I completed my 14,000th Mission Rosaries made, prayed and donated to Catholic Charity. God bless the Universal Living Rosary Association and ALL who support it! Email look weird? View it on the web here. We greet you with love and gratitude. Please do not let anyone be discouraged that they might be too late in sending to us the names of family, friends and beloved dead for the Lenten Bouquet of Masses. Our Easter is celebrated on May 1. The Holy Masses for our members will be continued up and through this date. In the Eastern Church, we never forget to pray for our departed loved ones. In this way, the living are comforted, reminded of the brevity of this life and encouraged to do penance in order to detach themselves from the material goods which bind them to this earth. Easter is the summit of the Mystery of the Sacred Liturgy! The individual who is happy enough to enter, with his whole mind and heart, into the knowledge and love of the Paschal Mystery, has reached the very center of the supernatural life. All is a preparation for Easter. The human race was dead and the gates of Hell were shut against it. On Easter, the Son of God rises from the dead and takes possession of Eternal Life. During the 40 days, Christ remained on earth after His Resurrection. He spoke to the apostles of the Kingdom of God. He redeemed man by His Blood and His Victory over death; He wrought reconciliation between Heaven and earth – all that now remained to be done was the organization of the Church. Three things were needed by the Church in order that She might carry on Her mission: a constitution framed by the very Hand of God, whereby She would become a visible and permanent Society; the possession of all the Truths which Her Divine Lord came upon earth to reveal or confirm and, in this, is included the right to teach and to preach infallibly; thirdly, the means whereby She was to apply to souls the fruits of the Sacrifice of the Cross, the Graces of Salvation and Sanctification. Hierarchy, Doctrine and Sacraments are the subjects upon which Our Lord instructed the Apostles during these 40 days before His Ascension into Heaven. They eagerly listened to all He had to say, for they knew He was to leave them soon. It is true that forty days after His Resurrection, the God-Man is to withdraw His visible presence from the world. He is not to be seen again on earth until the Last Day, when He will come again to judge the living and the dead. Even so, He could never abandon mankind, for whom He offered Himself on the Cross. We were to have the Church. It is to the Church He would leave His Authority and all the Truths He had taught; it is the Church that He made the dispenser of all the means of Salvation which He had destined for the world. The Church is a Society, unto which all mankind is invited to be members. This Society is the Spouse of Christ. It is by Her, He produces the elect. Outside of Her bosom, there is no salvation. “Thou art Peter and upon this rock, I will build My Church, feed My lambs!” “The gates of Hell shall not prevail against My Church.” Therefore, let the Church show Herself, take Her stand, and spread throughout the length and breadth of all Nations. Let us give thanks to Jesus, Our Divine Shepherd. The authority, strength and unity of the Church come from Him Who is Her infinitely powerful and merciful Shepherd! What is needed now are strong and united lay people in every parish, well informed, resolute and courageous, true apostles, who by their lives of holiness teach and preach the Faith to all those around them. Faithful souls through whose prayers, sacrifices and sufferings, bring the fruits of Our Lord’s Passion to those in distant lands who know not their Savior, and souls consecrated to the Mother of God reaching out to the world with Her Sacramentals and maternal love, that they might find Her crucified Jesus and, through Him, eternal salvation. By His Death, may we have eternal life! We are remembering you at the Sacred Altar in a special way during the Easter Octave and the weeks that follow. May your families have peace and may you be filled with the fearlessness, strength and courage needed to resist the evil by which you are surrounded and persevere do the end in the Grace and Love of Jesus Crucified! Dear Apostles of the Immaculate Heart of Mary,Thank you so much for your very generous donation which is such a splendid help in reaching out with Our Lady’s Sacramentals and printed materials. Through this means, the souls they reach will live in Mary’s Heart, love what She loves, and desire what She desires. God will be glorified and you will be blessed eternally! Our participation in the great Militia of the Immaculata during this most critical time in the course of history is the greatest privilege and the most singular blessing. It is an incredibly sobering responsibility. We are engaged in a battle against the principalities of Hell and it is a fight to the death. In order to obtain victory for Our Queen, we must be generous, courageous and heroic in our efforts, and keep in top spiritual fitness. The sacred Fountain of the Sacrament of Penance pours out upon souls the Most Precious Blood of Jesus that we may be purified from all stain of sin and find the sweet peace of divine strength. It gives us new ardor to move forward on the path of intimacy with Christ. Through the embracing Arms of God’s Mercy, we are lifted up to merit salvation by the power of His Most Precious Blood. Our hearts are softened, bad habits weakened, dispositions are changed, new habits are infused and entanglements are untied. How powerful the Sacrament of Penance is to restore peace to the troubled soul! We must ask God to help us make a good Confession. The Grace obtained for us in this Sacrament is that of absolute purity and delicacy of conscience so essential for intimate union with God. We consider here those things which separate us from the Love of God: disobedience, distraction, resentment, contempt for others and harsh judgement of them. Too late have I loved Thee, O Beauty Divine! O Eternal Charity, I dedicate to Thee all my works; I consecrate to Thee all my labors; I seek Thee in all, love Thee above all, and live united with Thee, Who art my All in AIl! The Living Rosary – Pakistan Center – February 2016On 13th February, I left for St. Mary’s Parish, Sukkur. Father Francis Anwar, who was newly transferred from Hyderabad, had invited me to visit some areas of his parish. We started our journey on the 14th morning and reached Khairpur which is about 15 miles from Sukkur. After the Sunday readings, I was invited to speak about the readings and also introduce the Living Rosary. After the Holy Mass, people were enrolled in the Living Rosary and given their Decade cards, Rosaries, Miraculous Medals, booklets, pamphlets, etc. We then crossed Sukkur, and went to Saints Peter and Paul Church, Panoaqil Cantonment which is about 29 miles from Sukkur. This cantonment area is said to be the largest in Pakistan and a nice Church has been built here with the help of the army. Here, after the Holy Mass, I was given time to introduce the Living Rosary and its aim. Then, the people were enrolled in the Living Rosary and they were given Decade cards and Rosaries. The Miraculous Medals, booklets and pamphlets were also distributed to the new members. From Pano Aqil, we left for St. Francis Xavier Church, Daharki which is about 47 miles. As we started our journey, I had a severe cough that worried Fr. Francis and the person with us. I drank nearly half of the cough syrup from the bottle in intervals and yet there was no relief. Father stopped the car at a road side hotel and we had some tea from there. Thank God, I could get some relief after having the tea. Fr. Francis went to church and advised me to take some rest in the parish house. After the Holy Mass, he sent for me and I explained about the Living Rosary, its aim and then enrolled people who wanted to say their Decade Daily. They were given Decade cards, Rosaries and other devotional items. We were back to the parish house at about 9 p.m.
From Sukkur, I went to Hyderabad on 16th. Mr. Boota Masih took me to the Immaculate Conception Church, Kotri where we had been invited by Rev. Fr. Gull. After the Holy Mass, I introduced the Living Rosary and enrolled the people in the Living Rosary Family. Then, we went to St. Francis Xavier Church, Sikandarabad. Once again after the Holy Mass celebrated by Fr. Gull, I introduced the Living Rosary, its aim and then distributed DD cards, Rosaries to the the people who enrolled in the Living Rosary. They were also given Miraculous Medals, booklets and pamphlets. From the 17th to the 22nd, I visited the Unique School System, St. Luke’s Church, Grace Town where Fr. Paulus offered the Holy Mass, St. John’s Elementary School, Kaalimori and St. Bonaventure School where I introduced the Living Rosary and talked on the history and importance of the Rosary. The lady in-charge of the school was a Muslim, who took a Rosary, the books and promised to say a Decade after she learns it. It was time to return home, so in the evening I got the train and reached next morning. On 22nd evening, I left for Gujranwala. I stay the night there and, next day, I went to St. Mary’s School, Saleem Colony on the invitation of Sr. Nazi Gabriel. She is a devotee to St. Philomena and requested me to tell about the life of St. Philomena also. So, I talked about the founding of the Living Rosary by Ven. Pauline Jaricot, its purpose and then the life of St. Philomena and her miracle in the life of Ven. Pauline Jaricot. St. Catherine Rosary Group was also invited by Sr. Nazi. They were all enrolled in the Living Rosary Family and were given Decade cards, Rosaries, Miraculous Medals, booklets and pamphlets. Small children were given Miraculous Medals only and the teachers and Rosary group were given large pictures. Then, I went to the Education School, Chanda Qila. Sr. Nazi had sent someone on the motor bike to drop me there but it was not easy sitting and holding the bag also. Thank God, we reached safely. Mr. Waris, the owner of the school, had invited parents of students also because I wanted to spread the Message of the Rosary. At all the places that the Living Rosary was introduced, the people were enrolled and given Decade cards, Rosaries, booklets and pamphlets. People and students were very happy and the priests, religious sisters and other persons who were with me were very thankful to the Living Rosary. I returned home at about 10 p.m. Thank you and our dear benefactors for supporting me in this mission of reaching souls with the Living Rosary and Our Lady’s Sacramentals. God bless all of you! Dear Mrs. Patti Melvin,Thank you for sending this latest material along with the additional prayer cards I requested. I immediately shared the booklet on Love and Suffering with one of my fellow inmates here. The next time I saw him, he thanked me, saying the material helped him resolve a difficult problem he was going through privately. I expect you will be hearing from Peter soon. I look forward to taking the prayer cards with me to Mass tomorrow. Much of my focus and attention right now is reaching out to the Catholic community here that has fallen away from the Faith for one reason or another. 42% of the prison population claim to be Catholic. Most of them prefer to attend the Protestant services because they are more FUN. It is fine if Christians get together to socialize, but we must bear in mind that there is a war going on at the spiritual level and everything is at stake! I will constantly promote the Living Rosary here and everything you send to me goes to bring souls back to God. The work you are doing is just wonderful and I am always inspired when I read the material you send. At the same time, it is also a kind of crutch for me since I am shy and it is hard for me to talk to others about religion and know the right thing to say. Instead, I offer them a pamphlet or booklet which I receive from you. Your stuff is really eye-catching and well received! By God’s Grace, our efforts have made a big difference in this unit. I first arrived here in 2011 and we were lucky to see a dozen show up for Mass. Since we have been working and spreading the Living Rosary, we now have 20 or 30 at Mass regularly. I can’t take much credit, but I will do what I can to keep it rolling. It seems to me when people are bent on getting drunk, what they really want is the Eucharist; and when they are being promiscuous, they really long for marriage. It occurs to me that so many of our youth belong to gangs because they are seeking to belong to a community that cares about them. This community is the Mystical Body of Christ. The Church has so much to offer them. Thank you for helping us to learn our Faith and live it. I am Fr. Julio Oo, a diocesan priest, from the diocese of Pekhon, Myanmar. I hope you are well. I met one of the leaders of the group that have great devotion to St. Philomena today and she asked me to share some of the photos they took of their activities. With the holy oil and pictures of St. Philomena, they were able to pray over some mothers that had hard time getting pregnant and later were able to deliver, also some others that were suffering from strange diseases. They were quite successful. We are truly blessed to have some of our parishioners involved in religious promotion. Many thanks for your support and prompt response. Thank you for sending me my Decade. Will you embrace whole-heartedly the devotion of the Immaculate Heart of Mary and consecrate to her your entire being? Will you let her fulfill in you her great promise of salvation? Will you let Mary use you to bring others to salvation through her Immaculate Heart? The world will obtain peace only through the Triumph of the Immaculate Heart of Mary. It is the Will of God, the key to Heaven! By it, we will have peace in our hearts, in our homes, in our country, in the Church and in the world. God has given over to Mary the special work of mothering the life of grace in us and ruling as our Queen. He has confided to her Heart, the mediation of all the treasures of His heavenly storehouse. Mary by her perfect surrender to God ~ her perfect consecration ~ became full of Grace, perfectly filled with God. By our consecration to Mary, we take on a new sacredness and strive, henceforth, to be only and always used for Mary’s hallowed mission. We pledge ourselves to learn of her, to love her dearly, to ‘spend and be spent’ in her sacred service, to call upon her in all our needs and to trust her absolutely! The first condition of devotion to the Immaculate Heart of Mary is based upon a true love of Mary. We cannot love someone we do not know, and the sad truth is that all too few know the Woman! We consecrate ourselves not because we are perfect, but rather to become perfect. True devotion is promptitude of WILL; it is a matter of setting one’s own will aside. If we are devoted to the Heart of Mary, it will not matter how we feel or what we want; always we will be instant and eager to be in her sacred service. Pope Leo XIII speaks to us of the mystery within the mysteries of the Holy Rosary: To Jesus through Mary! When we turn to Mary in prayer, she is able to fulfill uninterruptedly the office she holds before the throne of God as Mediatrix of Divine Grace. The merciful Heart of Mary appears in no other form of prayer so manifestly as the Holy Rosary. Mary’s Heart of love is reaching out across the world to gather people from every corner of the earth to her feet. She has been given the power to give souls to Jesus and Jesus to souls. Total Consecration unlocks the door of her Heart, the living tabernacle of the Most Blessed Trinity. Wherever we find true devotion to the Heart of Mary, there we will find true love of God. Nothing will be more effective today to bring forth the full intensity of Christian life in the world. Let us sacrifice ourselves to hasten the Triumph of the Immaculate Heart of Mary through Total Consecration and the Most Holy Rosary! Night is closing in, we must act now! Saint Philomena’s Apostolate is a Catholic Homeschooling Group in Ellicott City-MD, which meets 2 days a week at St. Paul’s Church to home-school together. We have 33 families this year and each year we invite all those children who are 10-18 years of age to join the Children of Mary program if they like. This year, we have 24 student members at our school and we meet once a month and do a service project. Last month, we put together “blessing bags” to give out to the homeless. This month, we were excited to string Miraculous Medals that the Universal Living Rosary Association provided us. In just under 2 hours, our students and a few enthusiastic parents were able to assemble 1,050 Medals which Mrs. Melvin will send out to the missions! Everyone enjoyed it and felt such a sense of accomplishment when we were finished. This is a fun and simple way to serve God in a group. They really enjoyed it. I would highly recommend this project to other Catholic groups. Thank you Patti! God Bless! We wish to thank you with all our hearts for the glorious support you are giving the Family of the Living Rosary which reaches the far corners of the earth. United the world over through the Immaculate Heart of Mary, our Daily Decades hold infinite power before the throne of God. Please reach out to everyone you can with this magnificent devotion of Faith, Hope and Charity. Mary, the Mother of Jesus, received an invitation to a wedding that would take place in Cana, Galilee. A wedding in Palestine and among the Jews was an important event and took the form of a religious ceremony, for it was the means of perpetuating the race until the fullness of time, that is, until the coming of the Messiah. It is good to attend to our social obligations. We should not just tolerate them, but rather cultivate them. One should never use the excuse of asceticism and become anti-social. Mary did not go to the wedding feast to be served. She was the first one to notice that the wine was running out. Nothing that a Christian does is indifferent, everything has repercussions. By the mere fact that the Blessed Virgin was there, the wedding feast at Cana was changed. Jesus and His disciples were invited. Charity obliges us to be our best. The more we are on fire ourselves, the more we enkindle the same fire in others. The closer and more united we are to God, the more good will we have for those around us. Sometimes, only a smile is needed or a little interest in others, or a friendly manner. We exercise our love for God in how we treat our neighbor. Christ should be placed at the center of society, so that His Spirit may permeate all human activities, transforming and renewing them. We must be like red-hot irons; otherwise instead of influencing our environment, it will overpower us, change us as it likes and make us slaves of worldliness. In a phrase of only a few words, Mary made known to Christ the need of the newly married couple: “They have no wine.” This was her prayer of petition. It is so brief and concise that it hardly seems a prayer at all. It is a statement of need, a petition of simplicity, made with total confidence. Mary was the most perfect of creatures; therefore, her prayer was, without doubt, the most perfect prayer. It is a humble prayer. She did not want to trouble her Son. He was God and His Mission came first. But, She was His mother and, in humility and helplessness, She appealed to His mercy. It was a prayer for others, not something for herself. She did not bargain with God, ‘If you do this for me, I will do that for you.’ When we bargain with God, the absence of our love for Him is so very obvious! Mary merely pointed out the problem and left the rest to Him, leaving Him perfectly free to do His own will. She told the waiters, “Do whatever He tells you.” The faith of Mary contained in these few words, overcame time and hastened the hour when Our Lord would manifest His divinity by a miracle. So often, we try to tie God down and restrict His action to only one possible solution, the solution that we, with our limited intelligence, consider the most fitting. If we do not get what we ask for, our prayer becomes weaker and weaker, and finally we abandon it altogether. Our Lord has shown us the way. We must only try to be simple, humble and trusting: God will do the rest. Our Lady asks us to do, not just something, but precisely what He tells us to do. We must listen to her Son, the Messenger of the Father. Christ was obedient unto death, even to His death on the Cross. There is no incompatibility between freedom and obedience. Humility is Truth! Truth makes us free! He is free who has no sin, for sin separates us from Truth, and makes us servants of falsehood and pride. We are free to the extent to which we are united to Christ – to Truth – by obedience. Obedience is the key virtue and the fulfillment of our vocation for every creature has been made to give glory to God. Disobedience is rebellion which results in death and damnation, obedience is salvation! Obedience is not simply avoiding mortal sin, for we are not simply to avoid offending God, but to love and please Him. We should learn obedience from the servants to whom Mary told to do whatever Jesus should command. They put themselves at His disposal immediately. When He told them to fill the water-pots, they filled them to the brim! They returned to tell Jesus that His orders had been carried out and, at His direction, they took the wine to be tasted to the chief steward, knowing only water had been placed in them. They never hesitated. They never tried to find out what was going on, they simply obeyed! They were servants and ready to serve. Promptness of obedience is essential for a servant. The consequences of delay, procrastination, passivity and unwillingness are immeasurable! Time is a gift too precious to be wasted. The servants obeyed without saying a word. Obedience should be silent. Protests, remarks and sneers at the Master undermine His authority. The jars were filled to the brim! No one could ask for more; the servants did a perfect job. We cannot obey in halves; we must do a complete job. What Our Lord tells us to do is too important to be left half-done! It is never something trivial, but a serious duty whose significance very often we cannot even suspect. This then is the advice, the only advice that Our Blessed Lady has left to us, that we should do whatever her Son tell us, obey Him willingly, be ready to do anything asked of us, obey promptly, silently, fully and with our whole heart. Mary gave us this perfect example at the Foot of the Cross. Let us imitate Mary in her obedience to her Divine Son for the greater honor and glory of God in time and throughout eternity! Dear Mrs. Patti Melvin,I am a mother of two children from Sri Lanka. I heard about your prayer group through one of my uncles who is very devoted to St. Philomena, who has been a great blessing to us in these troubling times that we are undergoing. I would like to join the Living Rosary. My husband and mother would like to enroll in the Living Rosary. Our son, Nevaan, who is just over two months, was born at 24 weeks weighing only 1.6 pounds. The doctors claimed he will not survive, but now he has been alive in the hospital for 78 days already. He had a brain hemorrhage that led to the development of some cysts in a critical part of his brain. The ventricles in his brain are severely enlarged due to this and the doctor says that this is almost 80% guaranteed to lead to severe disability later on. Added to that, there is a slight haze around his corneas, which also the doctors say may be a sign of blindness. So many prayers have been offered for him from priests, religious and all our family and friends. On the day after he was baptized, he started breathing on his own, without any machines. This is very unusual for a baby of his size, and is a miracle in itself. He went through a lot of complications but has gained weight and is looking better today. This is nothing but the power of God working, as the doctors and nurses are also surprised at how far this little fighter has come! We had drifted away from God and this trial has already been miraculous in the sense that it has brought us so much closer as a family and so very much closer to Him through prayers and sacrifice. Thank you so very much, truly divine providence that we received your parcel just on the day before the surgery! Baby Nevaan will undergo the brain surgery this Friday, February 26 at 7.00 am (Sri Lanka time) as the size of his cyst had drastically increased. The doctors are recommending the insertion of a shunt that will help drain the fluid that has accumulated. This will however be a life time device he will have to wear. We read an article in your Spring 2009 Dedicated Decades, a story of a 22 week old baby surviving a very similar ordeal and was healed through prayers. Similar to that story, we too have tied St. Philomena’s cord around his ankle, and we apply the holy oil on his heels daily. Please let us know if there are any other special prayers we can offer. Our little man is hanging in there, like the blessed little fighter he is! He has a 3 year old sister, Neraaya, who is really looking forward to having him in her life. She was also born prematurely at 32 weeks and is also another little miracle! Thank you for your message! The surgery went well without complication, and baby is recovering. We cannot thank God enough! This is more proof that God is holding us in His Arms through this journey, and Jesus’ Precious Blood will not fail to deliver! The journey with Nevaan’s condition is just beginning but we are confident in God’s goodness and expect a miraculous recovery for him in His time! Despite the doctors’ prognosis, we are so confident of complete healing for him. We have immense belief that through Our Blessed Mother and St. Joseph, and the intercession of St. Philomena, St. Jude, St. Anthony, St. Therese, St. Michael, St. Peter and all the other Angels and Saints that this child will receive complete healing. We have offered him up for a vocation and we know that his testimony will be a powerful one! Thank you and God bless, so happy to be part of this blessed Living Rosary group! Thank you for your encouraging and soul searching letters. You could see from the attached pictures how I was covered by so many rich materials: St. Philomena Oils, 56 packets of Luminous Rosaries, Miraculous Medals, Scapulars, wonderful wrist Cords; large pictures of St. Philomena, Holy Family of Nazareth, Our Lady of Fatima, Immaculate Heart of Mary; Life of Pauline Marie Jaricot, The Future of The Church, How to Secure a Happy Death, a Holy Hour Booklet, Novena to St. Joseph, our Patron, beautiful – this year we shall pray the chaplet of St. Joseph during our Community Novena to St. Joseph, Mater Dolorosa Chaplet, St. Philomena Chaplets, large Medals and pictures of St. Philomena, Calendars, The Holy Sacrifice of the Holy Mass, Mary The Power of Her Holy Name, Dedicated Decades for Spring and Winter 2015, the Garment of Grace, Fatima booklet, Holiness through Mary, Children your Mother is calling, etc. I am extremely happy and grateful for the Sacred Heart Novena Booklet. I am devoted to the Sacred Heart and the Holy Eucharist, our Source and Summit. The Sacred Heart bleeds everyday out of love for us. We are very, very grateful for the sacrifices you make to send us these spiritual materials for our spiritual growth. May Our Good God continue to keep you healthy and strong to continue to lead souls to Him. The History about the Living Rosary Center is good. It is a beautiful Center. We thank God for you. In the next parcel, kindly send large pictures of Ven. Pauline Jaricot so that during my talks I can show to the people. 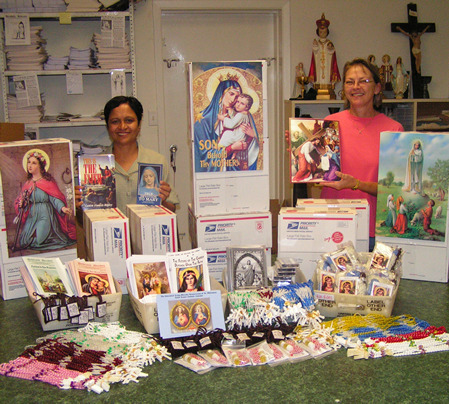 Members are begging for more Prayer for Spouses Cards, Decade prayer cards, Jesus’ Name prayer cards and St. Philomena statues. We are sorry for asking you too much! Please join me to pray for Sister Bernadette Nyongo, our great promoter, that St. Philomena may heal her miraculously. I remain grateful for all that you do for us. May Almighty God bless and reward you and all our benefactors! Please find attach the pictures. THE HOLY MASS IS YOUR LIFE! The rational man needs the Mass to pay Almighty God the debt of homage and adoration he owes Him. The grateful man needs the Mass to pay his debt of thanksgiving. The sinful man, and who among us is without sin, needs the Mass to propitiate God’s Justice and to pay his debt of satisfaction. The needy man needs the Mass, that praying with Jesus Christ and through Him, he may offer a prayer that is worthy of being heard and, thus, discharge his duty and debt of petition. At the hour of death, the Masses you have heard will be your greatest consolation. Every Mass will go with you to judgment and plead for pardon. At every Mass, you can diminish the temporal punishment due to your sins. Assisting devoutly at Mass, you render the Sacred Humanity of Jesus, the greatest homage. He supplies for many of your negligences and omissions. He forgives you all the venial sins you are determined to avoid. He forgives you all the unknown sins you have never confessed. The power of Satan over you is diminished. By hearing Mass, you afford the Souls in Purgatory the greatest possible relief. One Mass heard by you, during life, will be of more benefit to you than many offered for you after death. Holy Mass preserves you from many dangers and misfortunes that would otherwise befall you. You shorten your Purgatory by every Mass and win for yourself a higher degree of glory in Heaven. At Mass, you kneel amidst the multitude of Angels who are present at the adorable Sacrifice with reverential awe. You receive the priest’s blessing which Our Lord Himself ratifies in Heaven. You are blessed in your temporal goods and affairs. Nihil Obstat: P. L. Biermann, Censor Librorum. In the Byzantine Liturgical year, there are four major Penitential Seasons: the Great Fast of Lent (40 days), the Apostles Fast (length varies), the Nativity Fast (40 days) and the Dormition Fast (2 weeks). Simple fasting is observed on every Friday of the year. During the Great Fast of Lent, the 8th Sunday before Pascha (Easter) is the last day meat may be taken, and the 7th Sunday before Pascha is the last day dairy products may be taken. Essentially, at this point, Eastern Catholics are eating as vegetarians. For the most part during Lent, only one meal is taken during the day and, on Saturdays and Sundays, two meals are allowed. On Tuesdays and Thursdays, fasting is encouraged for those who are able, and those who cannot, may take bread and water. One cannot speak of the “Tragedy” of Calvary because there can be no tragedy in relation to Jesus and Mary. The fulfillment of God’s Will can never be tragic. Tragedy presupposes a blind and cruel fate which is indifferent to man’s suffering. No one can suggest that God did not love the Blessed Virgin. Nevertheless, He did not exempt her from Calvary. It is foolish in a Christian, unpardonably foolish, to think that, if God really loves us, as He does, He will exempt us from the cross, the very sign of a Christian! There are many Christians who flee from the Cross as from the devil; they are ignorant of the Cross and lack any brotherhood whatsoever with Christ. Mary could have remained in the intimacy of her home; her presence did not relieve the suffering and humiliation of Jesus. The Virgin Mary identified herself with her Son, her love made her suffer with Him. She loved Him and love unites. Mary’s love could not stand separation. Even in that terrible moment, She preferred suffering to separation, however great the suffering might be. There is a precise relationship between our capacity to love and to suffer. He who is not capable of suffering is incapable of loving! We love God to the same extent that we love the Cross. Mary stood at the foot of the Cross of her Son participating actively and intimately in the Sacrifice, identifying herself completely with Him and agreeing willingly, like Jesus, to the fulfillment of the Will of the Father. Mary drank the chalice to the dregs as She saw before her eyes the Life of her Son, whom She had carried in her womb, completely extinguished. Mary loved and accepted the Will of the Father even at the cost of the Life of her Son. She did not watch like a helpless soul, her participation was active. She did not beg for mercy for Him, She made no effort to change the course of events, but accepted them all with respect and reverence. Mary gave Him to the Will of the Father, Jesus gave Himself. For this reason, the Church calls Our Blessed Mother, Co-Redemptrix. Mary’s faith was greater and more heroic than any other human being in the world. Pain is not only visited upon those who sin. The innocent suffer also, because we are all members of the Mystical Body of Christ. Pope Leo XIII in his Encyclical, FUCUNDI SEMPER, points out that, “Every grace that this world receives is ordinarily distributed in three steps: from God to Christ, from Christ to the Virgin, and from the Virgin to us.” Even when we rebel and let go of her hand and refuse her help, still She does not desert us. We need Our Lady’s maternal love to protect, defend and console us. She loves us and will not abandon us, because we are her children. Let us make haste to Calvary in the company of our sorrowful Mother living her eternal FIAT in life and in death. Have mercy on us, O Mother of God, Our Life, Our Sweetness and Our Hope! You are remembered at the Sacred Altar during this holy Season of Lent. We pray for your courage and strength to carry your crosses with love, patience and resignation for the salvation of souls. May you achieve the very highest degree of sanctity and find deep meaning and God’s Peace in your lives! +In the Name of the Father, Son and Holy Ghost. Amen. Dear Patti and the Family of the ULRA,We would like to thank you all for the wonderful work and the Sacramentals. We received your boxes last year and started promoting the ULRA in our Diocese. We have seen many miracles taking place especially through St. Philomena’s cord and oil, and wrist cords. We have our own testimonies to share. I am sending our Annual Activity Plan for you to see our involvement in the Spiritual and Apostolic Program for this year 2016, as well as the photos taken during our St. Philomena feast day at Wati Parish in Nubu and the photos of our juniors and senior members of ULRA in the Diocese of Aitape. Patti, I have met our Rev. Bishop Otto Separy for a piece of land to build our ULRA Centre in the Diocese and the Bishop gave us permission to set up our Centre. When our Centre is complete, we will invite you and some of the ULRA members to come to Aitape, Papua New Guinea for the opening ceremony. Please pray for our financial funding either in cash or kind. May God bless you! My heart is filled with joy as I write to you on account of my grace-filled experiences during these past few days of promoting the Living Rosary devotion. On Friday, February 12, with the permission of the Rector of Pope John Paul II Major Seminary, Awka, I spoke to the seminarians about the Living Rosary. There were more than 280 seminarians present. The response was very encouraging! So many of the seminarians, if not all of them, got enrolled and many expressed their desire to become promoters of the Living Rosary. Providentially, one of the Priests accepted to help us from that day regarding the co-ordination of the Living Rosary promotion. Three seminarians will be helping him and I handed on the materials needed for the promotion of the devotion. On Saturday, February 13, invited by the national director of the Association of Mary Queen of All Hearts, I went to St. Scholastica Benedictine Abbey, Umuoji, to speak to and pray with the promoters of Total Consecration according to the teachings of St. Louis Marie de Montfort. (I am a member of the Association and together with other Priests, I worked closely with them before I left for studies in Rome). I spoke to them on Marian Spirituality and the Christian Family. I also introduced to them the Living Rosary. They were so delighted and all of them got enrolled! There were about 80 persons and came from all parts of Nigeria! The Association decided to make the promotion of the Living Rosary part of their regular Total Consecration programs! This means that each promoter goes to the grassroots, the parishes where 33 days are dedicated to teaching the Truths of our Faith in preparation for the Total Consecration, at the end of which, those who do the Consecration are also enrolled in the Universal Living Rosary Association. We now have a structure as well as experienced and trustworthy promoters all over the country. The Association of Mary, Queen of All Hearts enjoys the canonical status conferred on Her by the Holy See as well as the approval of the Catholic Bishops’ Conference of Nigeria. I see this as the work of Our Lady and Saint Philomena! The Diocesan centers of the Living Rosary will co-ordinate the distribution and collection of materials for the promotion. The National center will co-ordinate the regular posting of the completed enrollment forms to your office in Texas. Please send materials to Fr. Chinedu Basil Achusim, Fr. Aduaka Augustus, Diocesan Catholic Secretariat and Posi Fabio Rocco who are keen in promoting the Living Rosary devotion. The promoters of Mary, Queen of All Hearts have their meeting four times a year and these meetings precede the promotion of Total Consecration which is usually done four times a year too. The postal addresses of some Diocesan coordinators will be sent to you so that you can send them what you have for the national promotion of the Living Rosary. They will bring the all the materials to the next national meeting of the promoters for distribution to all the promoters. You just wrote me: “The hour is late, this you must know, and there is no time to lose.” It will be my joy to see the Living Rosary flourish in Nigeria to the Glory of God through the Triumph of the Immaculate Heart of Mary and the Salvation of Souls. With the despoiling of self and the life of faith comes the grace of pure love which is the very essence of perfection. “The Mother of fair love” says St. Louis de Montfort, “will fill the heart of Her true slave with the pure love of which She holds the treasury.” Through this communication of Mary’s love, the soul will be transformed into the image of Mary’s Son. Those thus favored feel that Mary has taken them under Her very special care and She remains almost ceaselessly before their souls, attracting them to Herself as a mother. She goads them on, leads them, directs them and enlightens them in all that concerns the life of the spirit. Graces flow into the soul almost unnoticed; it lives in Mary and is united with Her through love. In Her and through Her, God reveals Himself to His child as by a mirror. It is quite impossible to describe adequately the graces which flow from practicing this devotion to Our Blessed Mother. They differ in each individual soul; but Christ Himself gives us some idea of what we may expect in return for such a thorough surrender of self. Christ says, “Every man that has forsaken home, brothers, sisters, father, mother, wife, children or lands for my name’s sake, shall receive his reward a hundredfold, and obtain everlasting life.” That being so, what reward may not he expect who surrenders not only his attachment to persons and possessions, but even his whole self as an oblation of love to God through Mary? Is there, any reason to suggest that Jesus will be less generous in rewarding those who give Him themselves and all they have through His holy Mother? The wants of multitudes of souls are satisfied through the gift of one princely Child of Mary. His own needs are more than satisfied, along with those of countless other souls. Moreover, his obligations to pray for certain individuals or intentions are perfectly fulfilled. Not only has he committed to Mary the assets of his life, he has cast into Her mighty, majestic Heart all his liabilities and obligations as well. Everything is to be disposed of according to the Divine Will. If God desires me to pray for the Pope, or the Souls in Purgatory, or the Missions or benefactors or anything else at all, these intentions will be satisfied by Mary. The making of the Consecration does not mean that one’s ordinary prayers or actions need be changed in their form; life’s ordinary ways may be followed; usual intentions may still be recommended in prayer; but all is understood to be wholly subject to Mary’s good pleasure. Devotion to Mary should be the first obligation of each member. Mary must be honored as the Mother of every soul, and the Channel of every grace. From all that has been written, it will be seen that the spirit of the Child of Mary is nothing less than the spirit of Mary herself. Devotion to Her epitomizes, so to speak, all the elements of devotional life which together constitute authentic Marian holiness. Devotion to the Holy Eucharist, prayer, faith, hope, charity, humility, courage, prudence, perseverance, sacrifice, obedience, joy, enterprise, kindness – all these find their consummation and perfection when they are toiled for and practiced in the spirit of Mary. They must find expression in action. The outpouring of them all is through the mouthpiece of action. Action is, as it were, the setting in which all other characteristics of the apostolate shine forth like jewels. It is the setting which holds them together in proper pattern and brings them into service. In other words, it is action which makes the Child of Mary … that dominant note must be accentuated and his action must be intense and heroic. Love in action is a good definition of zeal for souls, Marian love in action is a perfect definition of the spirit of our apostolic labors. Our Lord prepared for the conversion of the world by gathering around Him a group of chosen souls whom He trained Himself and filled with His own spirit. Every priest naturally turns to the example of Our Lord and His Apostles to seek a pattern of work for the salvation of souls. He necessarily, therefore, agrees with Pope Pius X that “what is most necessary at the present time is to have in each parish a group of laymen at the same time virtuous, enlightened, determined and really apostolic.” And that is the essential idea of Mary’s apostolate – to bring the priest to the people at least in influence and understanding and work in inseparable union with the priest. The apostle should strive to reflect in his own life the pastoral virtues of the Priesthood and chief amongst these is zeal for souls. What a privilege it is to be called by Mary to practice, in a manner proportionate to the circumstances and obligations of the lay state, the vocational virtue of the priesthood! How absolutely correct it is to state that the spirit developed in the soul of each member must “find expression in action”! It is through the disciplined practice of Marian love in action that the Child of Mary is led towards the pinnacle of perfection. The apostolate is sanctified through Marian action. If the spirit of Mary grows in any soul, it will surely be given to him to share in the greatest work of Her who was so absolutely full of love that She was considered worthy to give to the world Him who is Love itself. More than anything else, the world of our day needs Christ. Events are proving that as of old, Mary is waiting to give Christ to the world and She is pleased to use Her faithful Children, unworthy as they are, in the accomplishment of that goal. This is the greatest desire of Her Immaculate Heart! The Way that will lead you to God!” Our Lady of Fatima. How great is the dignity of chaste wedlock may be judged best from this, that Christ Our Lord, Son of the Eternal Father, ordained it in a special manner as the principal and foundation of domestic society, and also raised it to the rank of a truly great Sacrament of the New Law. We are deeply grieved on seeing the great number of men who entirely ignore or shamelessly deny the great sanctity of Christian wedlock. Since these pernicious errors have begun to spread even among the faithful and are gradually gaining ground, We consider it our duty to raise Our voice to keep the flock committed to Our care from poisoned pastures, and as far as in Us lies, to preserve it from harm. The principal ends of marriage were laid down in the beginning by God Himself in the words: Increase and Multiply. Christian parents must understand that they are destined not only to propagate and preserve the human race on earth, but to educate their children who are to become members of the Church of Christ, partakers of immortal life and heirs of that eternal glory to which we all aspire. The right and duty to educate their offspring belongs in the first place to the parents who gave them birth. The Sacrament of Matrimony perfects love, confirms the indissolubility of the union and sanctifies both man and wife. Not under cover but openly: writings, theatrical productions of every kind, radio and all sorts of inventions of modern science, trample the sanctity of marriage. Divorce and adultery, and all the basest vices are commonly extolled and defended by modern genius. Timothy hath exhorted us, “Be thou vigilant … Preach the word, be instant in season, out of season, reprove, entreat, rebuke in all patience and doctrine.” (2 Tim. 4, 2-5) In order that the enemies’ deceits may be avoided, it is first necessary that they be laid bare. For the welfare of souls, We cannot remain silent. New forms of matrimony are concocted by man and labeled: Temporary, Experimental and Companionate. Some look upon children as a burden. But no reason, however grave may be put forward by which anything intrinsically against nature may become morally good. The conjugal act is destined primarily by nature for the begetting of children and those who deliberately frustrate its natural power and propose sin against nature commit a deed which is shameful and intrinsically vicious. Who is not filled with admiration to see a mother preserve the life of her offspring which she has conceived even though her own life may be in danger? God alone, all bountiful and all merciful as He is, will reward her for the fulfillment of the office allotted to her by nature and will assuredly repay her in a measure full to overflowing. No difficulty can arise that justifies the putting aside of the Law of God which forbids all acts intrinsically evil. God does not ask the impossible. There are no possible circumstances in which husband and wife cannot, strengthened by the Grace of God, fulfill faithfully their duties and preserve in wedlock their chastity unspotted. The family is most sacred. Men are begotten not for the earth and for time, but for Heaven and Eternity. The house built upon a rock, that is to say conjugal chastity, strengthened by a deliberate and constant union of spirit, will not only never fall away, but will never be shaken by adversity. The Church strongly warns against mixed marriages. Where there exists diversity of mind, truth and feeling, the bond of union of mind and heart is wont to be broken, or at least weakened. What God has joined together, let no man put asunder. The objections brought against the firmness of marriage are clearly answered. For, in certain circumstances, imperfect separation of the parties is allowed, but the marriage bond is never severed. Let the faithful be on their guard against the overrated independence of private judgment and the false autonomy of human reason. A characteristic of all true followers of Christ, lettered or unlettered, is to suffer themselves to be guided and led in all things that touch upon Faith or morals by the Holy Church of God through the Supreme Pastor, the Roman Pontiff, who is himself guided by Jesus Christ Our Lord. Let the faithful constantly keep in mind that they have been sanctified and strengthened for the duties and dignity of their state by a special Sacrament, the efficacious power of which is undying. As long as they remain alive, so long is their union a Sacrament of Christ and the Church. Ven. Brethren, be ever on your guard against the dangers advocated by the teachers of error, live soberly, justly and godly in this world, looking for the blessed Hope and coming of the Glory of God and Our Savior Jesus Christ. Baptism is usually administered outside the Communion rail, so is the Sacrament of Penance. When we receive Holy Communion or Confirmation, we kneel outside the Sanctuary. But at Marriage, provided it is celebrated in conjunction with Holy Mass, the Church throws open the gates of the Sanctuary, and introduces the candidates into the Holy of Holies, to the very spot where are offered the Body and Blood of Jesus Christ. Why is holy Matrimony celebrated in connection with the Holy Sacrifice of the Mass, which is the representation of Our Lord’s Death on the Cross? For this significant reason that Our Lord’s Death on Calvary was at the same time the greatest tragedy and the highest triumph of love! From it, the candidates are to learn, at the very moment of their marriage, their life, too, will be one of great and tremendous sacrifices, which will draw upon all the resources of their love and, by this endurance, their mutual love will best show its genuineness and celebrate its finest triumphs. Saint Raphael, loving Patron of those seeking a marriage partner, help me in this supreme decision of my life. May he (she) be upright, loyal, pure, sincere and noble, so that with united efforts, and with chaste and unselfish love, we both may strive to perfect ourselves in soul and body as well as the children it may please God to entrust to our care. O Sweet Jesus, grant that I and my spouse may have a true and understanding love for each other. Grant that we may both be filled with faith and trust. Give us the grace to live with each other in peace and harmony. May we always bear with one another’s weaknesses and grow from each other’s strengths. Help us to forgive one another’s failings and grant us patience, kindness, cheerfulness and the spirit of placing the well-being of one another ahead of self. May the love that brought us together grow and mature with each passing year. Bring us both ever closer to Thee through our love for each other. Let our love grow to perfection. Amen. By God’s Will, Mary’s power is without limit. Therefore, the apostolate’s trust in Her is well-nigh infinite. God gave to Mary everything He could; She could not receive more than Himself. By working in complete union with Her, the Child of Mary puts himself in the very flood-tide of grace, for She is the channel of every grace merited by Her dying Son. Not alone does She communicate all graces to us, She obtains them for us, too. Everything there is in this world of hope, grace and salvation flows to men from Mary. To approach God more effectively and win grace more freely, he strives after perfect union with His Mother! Moreover, the battle in which Mary’s Army is always engaged is the conflict with sin. Mary alone, of all our race, is perfectly sinless. Therefore, he who would conquer sin either in himself or in others, keeps himself so closely united to the Immaculate Virgin that everywhere and in everything he acts as Mary’s instrument. He endeavors to bring it about that, through his subjection to Mary, She acts in him, with him and by him to such an extent that it is really Her apostolate rather than his that is carried on. When such is the case, the apostolate is, in truth, the seed of Mary; between it and sin, enmity is complete. Just as Christ gave Himself absolutely to Mary, so the Child of Mary is encouraged to surrender to Her everything: Every thought, every movement of his soul, his hidden riches, his inmost self. Everything up to and including his last breath is to be given to Her that She might expend it all for God. Even the earthly slave remains master of his thoughts and inner life; he is free in everything that really counts. Not so Mary’s slave. He offers himself to a kind of martyrdom; through love, he sacrifices himself completely to God, and Mary is the altar of the sacrifice. True Devotion is not merely an act; it is a state, a life. True, it is solemnly inaugurated by an act of consecration to Mary, but it consists principally in living afterwards in the spirit of that consecration. Mary must take possession of the whole of one’s life; otherwise there is no real Montfortian Devotion. The act of consecration may be made; it may even be often repeated and, if the substance of True Devotion is not there, a tree has been planted, but it has failed to take root. This does not mean that the Children of Mary are expected to do the impossible by keeping their minds ever fixed upon their consecration to Mary. It would be almost as reasonable to suggest that one should always remember the fact that the beating of the heart controls the life of the body. The heart continues to function even though its operations rarely become the definite objects of thought. Similarly with the True Devotion. It works ceaselessly in the life of the soul, even though it is not consciously adverted to. The thought of Mary’s complete dominion should be made vivid now and again by deliberate thought and prayer; if that is done, it is sufficient that the fact of one’s dependence on Her remains immutably recognized, that it be always at least vaguely before the mind and that it be put into force in a general way in all the circumstances of life. It is not necessary that the inauguration or subsequent practice of the True Devotion be accompanied by warmth or consolation. It does not depend on feelings or fervor or any kind of emotional experience. Its foundations are reason, faith and the loving resolve of the will, and these are completely independent of the feelings of the senses. St. Louis de Montfort claimed that the devotion he taught is an authentic message from Heaven. This has undoubtedly been verified through the graces that have attended the practice of it and the position it has attained in the devotional life of the Church. There can be no questioning the fact that the practice of True Devotion deepens the spiritual life, endowing it particularly with purity of intention and unselfishness. These things are of the very essence of the teaching of St. Louis de Montfort; one is called upon to practice them incessantly. It is a matter of experience that by such complete surrender and submission to Mary one advances more in a few months than in many years of spiritual effort based more on reliance on self and one’s own will. The true servant of Mary finds himself comforted and strengthened by a strong and certain sense of guidance and protection. Mary seems to make herself so near and present to him that he is enlightened in his doubts, strengthened in his fears and sustained in his battles. It is this sense of being always directed and safeguarded by Mary that enables him to persevere in his quest for souls when so many others who begin apostolic work under other auspices fall by the wayside. It is extremely difficult to think of any way of spirituality more designed to bring with it a certainty that one’s life and everything in it are being employed to the best advantage. He who is faithful to his devotion to Mary has that certainty; he is consequently free from many worries and anxieties and at liberty to pursue unrestricted his own progress towards perfection and his apostolate of charity. By this interior liberty, scruples are banished and the heart is filled with burning love and limitless trust. One cannot really surrender all to Mary without attaining a super-natural outlook. The constant attempt to live as Mary’s slave of love implies a gentle but constant effort to acquire Her spirit and outlook. She, more than any other creature, was accustomed to judge of everything from the super-natural point of view; between Her and the world enmities were complete. Therefore, the soul surrendered to Mary and attempting to live always in the spirit of that surrender necessarily finds himself more and more inclined to evaluate all from the standpoint of the supernatural.